Excitement over the Orange County Vital Brain Aging program has begun to attract national attention. 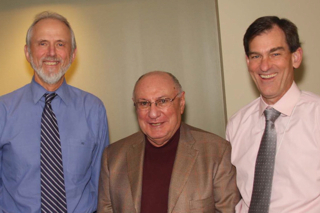 Hoag hospital was recently visited by Zaven Khatchaturian (center), who is formally evaluating the program's effectiveness on behalf of the grant-maker, the Unihealth Foundation. Dr. Khatchaturian is the former Director of the Alzheimer's program at the National Institute of Aging, and he now serves as the President of Prevent AD by 2020, a Washington D.C. based non-profit focused on eliminating Alzheimer's disease in the coming decade. During his visit, Dr. Khatchaturian met with community partners who are participating in the program, discussed progress and challenges with the program team at Hoag hospital, and reviewed the results of Vital Brain Aging educational initiatives to date. He also visited the community memory screening operation and attended a meeting with expert physicians in the community who serve on the program's advisory panel. In the course of a full day, he had contact with nearly every facet of the program and gained a solid understanding of its early progress. Based on his initial review and remarks, Dr. Khatchaturian was impressed with the successful launch of the program, and the extent to which the community has embraced this initiative to maintain brain health through the aging process. This is a meaningful endorsement of the program given that he was a key architect of the blue print upon which the program is based, and that he has extensive experience in establishing infrastructure programs in this field. While there is much work left to do in the coming years, Dr. Khatchaturian's involvement signifies a high level of importance and national visibility for the Vital Brain Aging program.